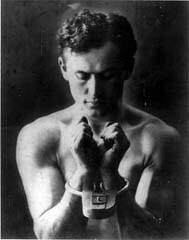 The Wall Street Journal reports (available here without a login) that the Outagamie Country Historical Society's exhibit on Harry Houdini includes an exposure of the workings of his famous "Metamorphosis" illusion, known in modern circles as the Sub Trunk. In the Sub Trunk illusion, the performer steps inside a duffel bag inside a trunk. An assistant ropes or chains the duffel bag shut, and closes the trunk, locking the performer inside. The assistant then steps atop the trunk, raises a curtain and, in an instant, the performer rips the curtain aside, revealing that the performer and assistant have switched places. It is a truly eye-popping illusion. I have seen it performed by, among others, The Pendragons and David Copperfield, and I never get tired of it. A subset of magicians, however, is outraged at the Historical Society's exposure. They call it a betrayal, a heresy, an atrocity that would have Houdini spinning in his grave. Even David Copperfield himself called the Historical Society to protest the exhibit. Every couple of years, the magic community undergoes fits of apoplexy as the latest TV special or museum exhibit threatens exposure of popular illusions. It's undercutting our livelihood! These secrets are our stock in trade! Our code of ethics dictates that we only share secrets with those who show a real interest in the art! And yet, in spite of the hysteria, magic rumbles onward. Indeed, recent years have seen a magnificent revival of grand illusion and close-up magic alike. Acts like Lance Burton and (until their recent tragedy) Siegfried and Roy are among the hottest tickets in Vegas. Close-up magicians wander the aisles in family restaurants and attract thirsty onlookers behind bar counters. Magic is as strong as it has ever been, and it will live to overcome the exposure in Appleton, Wisconsin of one of its venerable secrets. It always has before. Hi Carla-- nice entry. As someone who is married to a sometime magician, I can appreciate your commentary, and I think there are many magicians who share your stance. My husband feels that the exposures will ultimately make magicians more creative, although with several friends in the illusion designing game (who btw, don't seem too phased by exposures), I can see both sides of the issue. In any event, I spent last weekend on the perimeter of the Magic History Conference, and can tell you that some magic never gets old. Palingenesia, The Mighty Cheese and Devant's Haunted House (among many others) are still incredibly entertaining, and I defy the layman-- and a lot of magicians-- to tell me how they work!